Cocoa Flavanols: A Magic Potion for Protecting the Endothelium in Kidney Failure? ESRD is a most vexing condition for the cardiovascular (CV) system. The risk for CV death in this population (43 per 1000 person-years) is nine times higher than that observed in the general population (1), and no meaningful improvement in CV prognosis has been registered during the last 20 years in this population. All major pharmacologic trials testing statins, erythropoiesis-stimulating agents, and agonists of the calcium receptor failed to improve CV outcomes in ESRD (2). Thus, testing new CV interventions in ESRD remains a real public health priority. The list of CV risk factors in patients with ESRD on dialysis is long and includes traditional risk factors and risk factors peculiar to this condition (3). Among these, disturbed nitric oxide (NO) metabolism is considered as a crucial one. Mainly because of the accumulation of endogenous inhibitors of NO synthase (4) and limitations in substrate (l-Arginine) availability (5), NO generation in this population is markedly reduced (6). 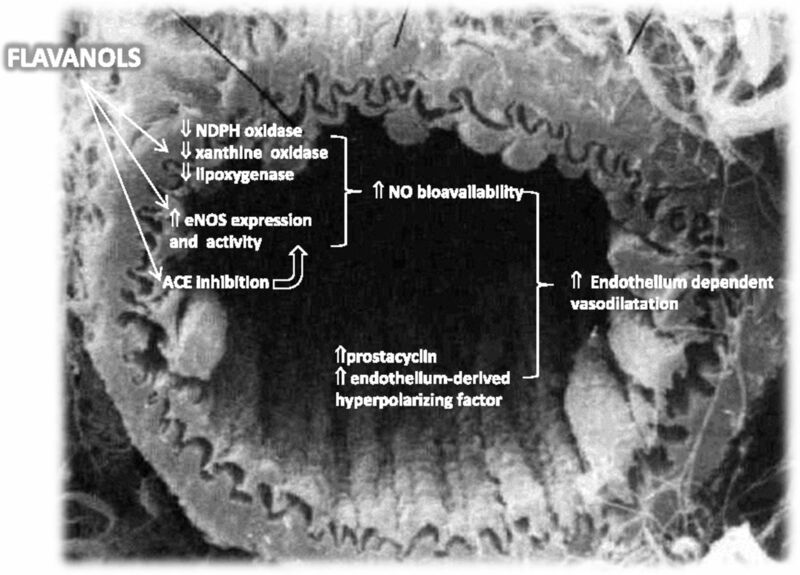 Low NO bioavailability in ESRD is implicated in endothelial dysfunction, atherosclerosis, cardiomyopathy, and a variety of disturbances encompassing immune system dysregulation, inflammation, and various neuroendocrine changes (7). Given the multifaceted role of low NO bioavailability in the complex alterations of ESRD, interventions aimed at restoring NO synthesis may reverse processes of fundamental relevance for the high CV and non-CV risk in this condition (1). Flavonoids are polyphenolic compounds contained in fruits and vegetables, and their average dietary intake ranges from 200 to 400 mg/d. These polyphenols share a C6-C3-C6 structure (i.e., two aromatic rings [A and B] joined by a three-carbon bond configuring oxygenated heterocycle compounds). At least six flavonoids subclasses have been identified (flavanols, flavones, flavan-3-ols, flavanones, anthocyanins, and isoflavones), which show differences in oxidation state and chemical groups in the C ring and the connection of this ring with the B ring (8). Metabolic processing of these compounds further increases their structural complexity with the addition of methoxy groups, glucoronids, sulfates, phenolic hydroxyls, and O-sugars groups, and the list of flavonoids includes >5000 compounds (8). Within the flavanols subclass, compounds like procyanides, catechin, and epicatechin are considered as food constituents with proven beneficial effects on the endothelium by the European Food Safety Authority (9). In vitro and in vivo studies as well as cohort studies (10) suggest that high intake of at least some flavonoids may be associated with a reduced risk for coronary heart disease and stroke. The effects of these polyphenols on vascular health depend on various mechanisms (Figure 1). Some of these are linked to their antioxidant effect, including reaction with superoxide and reactive oxygen species (11) and inhibition of major enzymes impinging on reactive oxygen species generation (nicotinamide adenine dinucleotide phosphate oxidase, xanthine oxidase, and lipoxygenase) (12). In addition, flavonoids directly increase endothelial nitric oxide synthase expression and activity (13) and inhibit angiotensin converting enzyme (ACE) activity (14), a mechanism that may serve to further increase NO bioactivity. Enhancement of prostacyclin and endothelium–derived hyperpolarizing factor synthesis are additional relevant mechanisms, and these compounds may impinge on endothelium-dependent vasodilation (13). Of note, flavonoids interact with lipids in biologic membranes and by this mechanism, may affect the activity of membrane-bound enzymes, ligand-receptor links, and signal transduction to the cell (15). Cocoa flavanols, in particular, possess clear–cut biologic activity on the vascular system. In a double–blind, randomized trial in overweight and obese subjects, a beverage containing about 900 mg flavanols substantially increased endothelium–dependent flow–mediated dilation (FMD), the proportional increase in FMD induced by flavanols being highly significant and biologically relevant (38%) (16). Three additional randomized trials in patients with cardiac ischemia nicely confirmed the effectiveness of these compounds on endothelium-dependent FMD (17–19). Mechanisms whereby flavonoids may favorably affect nitric oxide (NO) bioavailability and endothelium–dependent flow–mediated vasodilation. These mechanisms are described in more detail in the text. ACE, angiotensin converting enzyme; eNOS, endothelial nitric oxide synthase; NDPH, nicotinamide adenine dinucleotide phosphate. In clinical research, the randomized trial on the basis of clinical end points is the unquestionable definitive proof of the efficacy of interventions on human diseases. In this respect, it should be noted that increasing the dietary intake of flavonoids or using flavonoids supplements is well tolerated, but the safety of consumption of large amounts of concentrated supplements of these polyphenols should not be taken for granted (20). Although the evidence that flavonoids exert favorable effects on the CV system in studies on the basis of surrogates like FMD (16–19) or pulse wave velocity (21) and may lower BP in human hypertension (20) seems robust and credible, until now, there has not been a large trial on the basis of clinical end points showing a benefit by these compounds. Thus, although likely, the therapeutic benefit of flavonoids for the prevention and treatment of CV disease remains an open question. Testing flavonoids-based interventions in kidney failure is of utmost interest. The effectiveness of flavonoids for reversing endothelial dysfunction, the very basis of atherosclerosis, makes these compounds a potential treatment for curbing the CV risk excess of this condition. In this issue of the Clinical Journal of the American Society of Nephrology, Rassaf et al. (19) report a randomized, double–blinded, placebo–controlled trial aimed at specifically confirming in the dialysis population the hypothesis that flavanols may help to restore FMD in these patients. Rassaf et al. (19) tested the acute effect of cocoa flavanols at baseline and during chronic treatment and examined whether these compounds may mitigate the negative effect of hemodialysis on FMD. The flavanols beverage was safe and improved FMD by 53% in the acute setting without modifying BP. During the chronic study (30 days), FMD rose by 18% in the active arm but remained totally unmodified in the placebo arm, and such a favorable effect was accompanied by a 4-mmHg reduction in diastolic BP, which was significant versus placebo. By the same token, cocoa flavanols mitigated the negative effect of dialysis on FMD, and such an effect persisted over time. This trial seems well done from design to results (19). Findings in this study suggest that endothelial dysfunction and perhaps, atherosclerosis should not be considered as unmodifiable alterations in patients with CKD. Patients with heart failure were excluded from the trial, but a beneficial effect in these patients seems likely. Indeed, in an experimental model of chronic heart failure, ACE inhibition normalized NO–dependent dilation and suppressed vasoconstrictor prostanoids, thereby improving FMD, a phenomenon that might contribute to the beneficial effects of ACE inhibition in this condition (22). Findings in the study by Rassaf and coworkers (18) have a high internal coherence, because cocoa flavanols increased the FMD response to forearm ischemia in both the acute and chronic settings and because the same intervention mitigated the negative effect of hemodialysis on endothelium-dependent vasodilation. Some caveats remain. FMD is considered a robust surrogate biomarker, because pharmacologic and nonpharmacologic interventions produce a parallel improvement in FMD and CV outcomes in individuals in the general population and patients with CV disease (23). However, findings in these populations do not necessarily imply that FMD is also a valid surrogate in patients with ESRD. Although flow debt repayment has been associated with mortality in a study in patients on dialysis on the basis of just 24 deaths (24), FMD—the surrogate applied in the study by Rassaf et al. (19)—has never been specifically linked to death and CV events in the same population. The importance of validation of surrogates in patients with CKD cannot be overemphasized (25). Thus, FMD remains a promising but yet unvalidated surrogate end point in kidney failure. These caveats notwithstanding, the burden of CV disease in patients on dialysis is so devastating that a promising intervention like cocoa flavanols deserves full attention by the nephrology community. If confirmed in other studies on the basis of the same surrogate and then, a trial on the basis of clinical end points, the findings by Rassaf et al. (19) may be a turning point in the fight against CV disease in patients on dialysis. Cocoa flavanols seem to be remarkably beneficial for the endothelium in these patients. Whether this benefit may translate into a real reduction in CV risk in ESRD remains only a reasonable hope. Trials on the basis of clinical end points represent a great opportunity and an ethical obligation for investigators who started this promising research field but also, health agencies and investors who have made possible the breakthrough studies supporting the cardiovasculoprotective efficacy of these compound in a high-risk population, like patients with ESRD. See related article, “Vasculoprotective Effects of Dietary Cocoa Flavanols in Patients on Hemodialysis: A Double–Blind, Randomized, Placebo–Controlled Trial,” on pages 108–118. You are going to email the following Cocoa Flavanols: A Magic Potion for Protecting the Endothelium in Kidney Failure?